No matter how good of the customer service you provide or how great your amenities are, hoteliers, at one time or another, will encounter guest complaints. From dirty sheets, plumbing problems, bed bugs, or an encounter with a rude staff member, guests will find something to complain about and they may even broadcast these problems with the rest of the online world. In that case, hoteliers need to be prepared to defend themselves, especially if the reviewer leaves a false claim. It is not enough to monitor what is being said about your property. It is crucial that hotel management respond to these negative reviews in a timely manner. There are plenty of review sites that allow hoteliers to respond to reviews like TripAdvisor, Yelp and Google+ so take advantage of this opportunity and comment back! Appropriate responses should include a sincere apology, a promise to address problem, and a brief exclamation as to how you intend to fix the problem and make their next stay more pleasant. Make sure to respond in a timely manner, this shows that guest feedback is important to you and that you value customer service. By acknowledging and simply addressing the review, a frustrated guest can often be converted into a loyal customer. If you leave a management response letting the reviewer know that you intend to correct the issue then make sure that you follow through with any promises made and actually fix the problem. Create a game plan with your staff and take the necessary steps to resolve the issue. 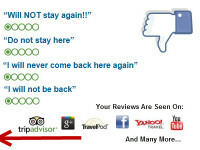 Take these negative reviews as constructive criticism to help you improve your hotel’s services. Generally, with online reviews, a reader has to see the same complaints over and over for him/her to be convinced it’s true. That said, if you fix the problem after one review, you shouldn’t hear the same complaints from future guests. Don’t let the bad reviews pile up or else you will have to constantly defend yourself. Make sure to reassure the reviewer and potential guests reading the ‘bad’ review that the issue will be resolved. It is also a good idea to give details as to how you and your staff deal with the issue. Remember to take initiative and be proactive by training staff, making appropriate renovations and fixing any recurring problems. Like with any customer service, the truth of the matter is that the guest is always right. Make an effort to win guest loyalty back. Take these guest reviews as an opportunity to reevaluate the issues that they bring up to strengthen your property’s amenities and services and to ultimately enhance the guest experience. Let your responses be a way to express your desire for them to stay the hotel again. Go even further by offering a special deal on their next stay at the hotel. Remember guest experience and loyalty is key. Create a pleasant experience for your guests while selling your property truthfully. Simply put, keep your guests happy and by doing so, expect them coming back and referring friends to stay at your hotel.